China’s inventory of refined aluminium has been oscillating between 2.231 million tonnes and 2.227 million tonnes since more than a week. 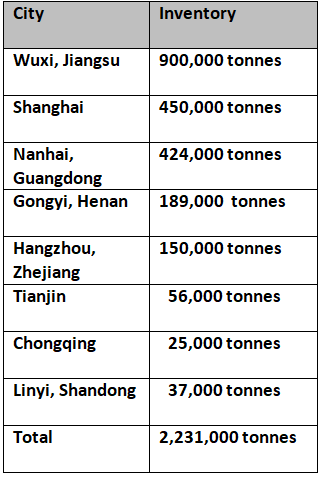 After a plunge to 2.227 million tonnes on April 8, 2018, the inventory including SHFE warrants once again soared to 2.231 million tonnes on Thursday April 12, 2018, with increased transactions in some of the major Chinese cities like Wuxi and Jiangsu, Shanghai, Tianjin and Chongqing. 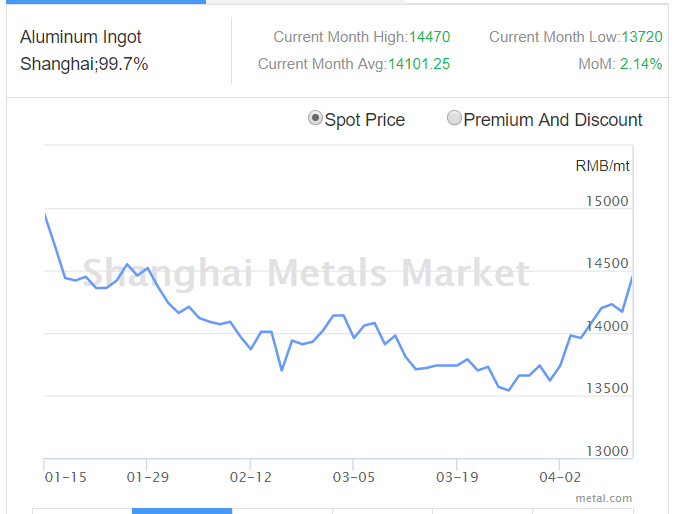 According to another update from Shanghai Metal Market, average A00 aluminium ingot price jumped conspicuously from the previous day to close at RMB 14450 per tonne. Although aluminium ingot price was more or less on a rising spree over a couple of weeks from RMB 13960 per tonne on April 4 to RMB 14080 per tonne on April 9 followed by RMB 14200 and RMB 14230 per tonne on April 10 and 11 respectively, this has been the most discernible rise this week. The prices are expected to range between RMB 14430 and RMB 14470 per tonne with spot discounts to settle at RMB 100 to RMB 60 per tonne. Similarly, alumina price also decided to show a stunt by attaining RMB 2764 per tonne today April 13, 2018, up from RMB 2750 per tonne yesterday, SMM research found. On the other hand, as far as the input costs are concerned, aluminium alloys price also grew marginally from RMB 15850 per tonne to RMB 15950 on April 13, 2018. But amidst this, prices of ADC12 aluminium alloys exports to Japan stood lowest in 2018, at US$ 1945 per tonne, as updated by SMM on April 12, 2018, against the export price US$ 2050 per tonne in March. SMM further updated that Japanese buyers have adopted a watch-and-wait stance after ADC12 aluminium alloy, offered at US$ 1945 per tonne was rejected by a buyer from Japan.